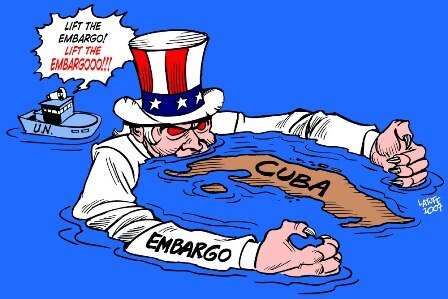 A recent New York Times editorial denunciated the unproductive 54-year old United States embargo against Cuba and exhorted President Obama to end it. The editorial’s publication is not remarkable because the same argument has been made before in the media. What is unusual is that a second click will take the reader to a Spanish translation. Shortly afterward Fidel Castro wrote a column in Granma, a Cuban newspaper, analyzing in detail the Times’ editorial [[l]]. The New York Times, in turn, ran an opinion page about Fidel’s column. It also appeared in Spanish translation. In the past few days I’ve been pondering the significance of the New York Times’ bilingual columns. They are a step in the right direction because they seem to recognize the validity of Spanish, which is the language with the second largest number of speakers in the US. I should note, however, that all of the bilingual New York Times’ columns I mentioned pertain to just Latin American issues, which some may see as a reflection of the common perception that Spanish is not “American.” Moreover, the publication of Spanish columns in a major newspaper can give the false impression that the racialized status of Spanish in the United States is crumbling. That is not the case. Spanish is still racialized because its speakers are still racialized and there are no indications that their status is changing.